Have you ever felt the pressure for your brand to be on all the popular social media channels? You are not alone. The good news is you don’t have to go down that path. Be strategic, and don’t try to be everywhere. Focus on the networks that are most relevant to your brand, and make your content awesome. Here are five tips to help you get started. Take a moment to clearly define whom you’re trying to reach. Think of your ideal candidate or customer. Put yourself in their shoes. What age are they? What interests them? What do they value? Where are they living? Answering these questions will tell you what social media platforms to target. If you’re trying to reach teens ages 13 to 17, YouTube is the most popular social media channel, with 85% of them using it. 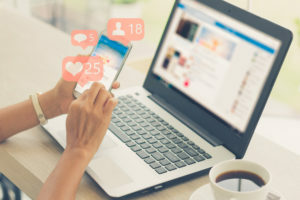 Or you might consider Instagram and Snapchat, as about 70% of teens are actively engaging on those platforms, according to the 2018 study “Teens, Social Media, and Technology” completed by the Pew Research Center. Part of knowing your audience is knowing what resonates with them. A great way to do this is to look at your competitors or at other successful similar campaigns. Analyze which ones had the most engagement and why. When I was the communications director for a sheriff’s office, we found that humorous recruitment videos had more views and shares than serious ones. That data drove our decision to create a video with a sense of humor. But most of all, figure out the key factor that will set your brand apart. How can you be better than the rest and stand out? Videos and photos are the most engaging way to bring your brand’s story to life, but they must be genuine and not overly promotional. In fact, 91% of consumers value authenticity and are more likely to share a brand’s story with family and friends if it feels real. Attention spans have hit the lowest point ever—about eight seconds. People don’t have the patience to sift through long content. When I launched a law enforcement recruitment video, we had a long version and chopped it up into several small 15-second video clips. We used these clips to run on Instagram, and then directed people to watch the full video or learn more on the website. If the clip is good enough and they’re interested, they’ll want more. Think of how you can add value to people’s lives through your content. For example, if you’re a real estate company, you can write blog posts about the best times to buy a home or simple ways you can prepare your house to sell or stage. Make a content calendar to ensure you have good content consistently. Brainstorm what you’ll post, create it, and schedule it. This preparation will ensure that you don’t leave your followers hanging. Let your engagement drive content creation. If you notice certain posts are doing well, then make more posts like that. Be a social listener. If your followers are commenting or asking questions, answer them. Once you launch your content, see how your audience reacts. Are people engaging? Hopefully due to your preparation and research, the answer will be yes. If not, don’t be discouraged—go back to the drawing board and use the lessons learned to improve.